Premium subscribers may to post links to their Facebook, Twitter, LinkedIn and/or Google+ Pages in their Premium Listings. Please visit Social Media Sites for Promoting Law Firms to learn about the importance of social media sites for professionals in the legal field. Links to your company's Facebook, Twitter, LinkedIn and Google+ pages appear in the Social Networks and Place Pages section, at the bottom of your listing, beneath the More Information section. To take advantage of this valuable new feature, please follow these step-by-step instructions. Sign in to your HGExperts.com account. In Account Management, click on the Update your Listing link under "Manage your Account". 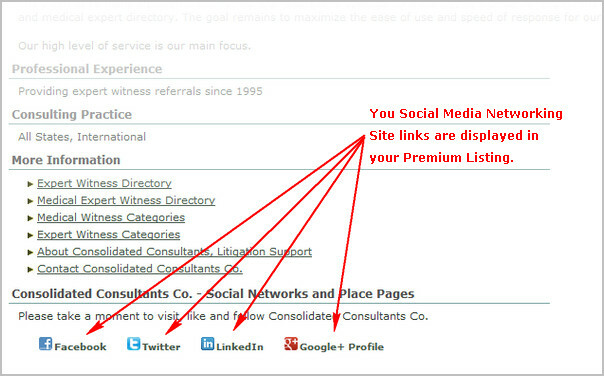 In your Listing Form, scroll down to the Links to your Social Networks section. After entering the URL's for your Facebook, Twitter, LinkedIn and/or Google+ pages, click once on the Save this Form button at the bottom of your Listing Form and your Premium Listing will be updated with your new links. Please be sure to add the HG.org email address to your list of approved senders. For help with this, please visit Email Whitelist Instructions. HG.org screens all listing applicants for validity and reserves the right to refuse to post your listing or to remove your listing, at our discretion, if you do not adhere to our editorial guidelines, or should we determine your business/company is not legitimate or misrepresents its business, services, etc. in any manner.